World Health Organisation (WHO) has declared May 5th as "Clean Your Hands" day to promote hygiene and reduce infectious diseases. Hand washing is the act of cleansing the hands with or without the use of water or another liquid, or with the use of soap, for the purpose of removing soil, dirt, and/or microorganisms. 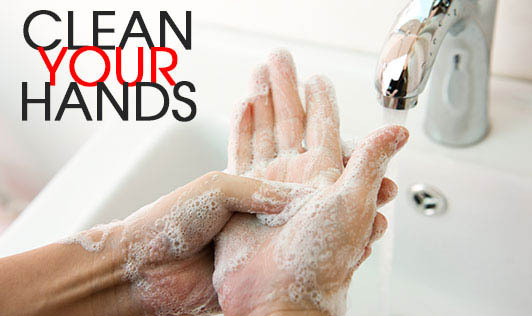 Hand washing is the most important thing you can do to prevent infection. The main medical purpose of washing hands is to cleanse the hands of pathogens (including bacteria or viruses) and chemicals which can cause personal harm or disease. This is especially important for people who handle food, or work in the medical field, but it is also an important practice for the general public. People can become infected with respiratory illnesses such as influenza or the common cold if they don't wash their hands before touching their eyes, nose or mouth. • Returning home after an outing. • Wet your hands under the running water. • Use liquid soap to lather your hands and wrists. Be sure to scrub your fingernails too. • Rinse your hands very well under running water. • Dry your hands with a clean dry towel or a paper towel. Do not dry with a used towel because this may put germs right back on your hands. In a public place it is best to use a hot-air hand dryer. Of late, hand santizers are available in India, which can be used in place of soap & water. It's very convenient to use during travel, or outside an office / home.